I made my first grocery trip in a while last night and came home with more fresh produce than ever before! (Kind of sad, I know, but hey!). I also read a lot of labels – did you know that Walmart brand mayo has high fructose corn syrup but the Kraft brand doesn’t? I know now! I was happy to use $8 or so worth of coupons and still came in under budget! I have plans to try a few simple recipes this week and enjoy our fresh produce! I also picked up some Truvia to try and some whole wheat flour for baking. I’ve been praying about priorities for our family as far as food choices go, so we can take this one step at a time. I feel the most strongly about staying away from the high fructose corn syrup and the partially hydrogenated oils so that’s where I’m focusing for now. I’m also trying to eat more fresh food in general and notice the labels on the meat and eggs in particular. We’re planning to build our garden this weekend! I’m going to price materials tomorrow – that will help determine if we start with one bed or two. Here’s a schematic of our potential garden – thank you Cara! It’s a little blurry but hopefully you can get the idea. 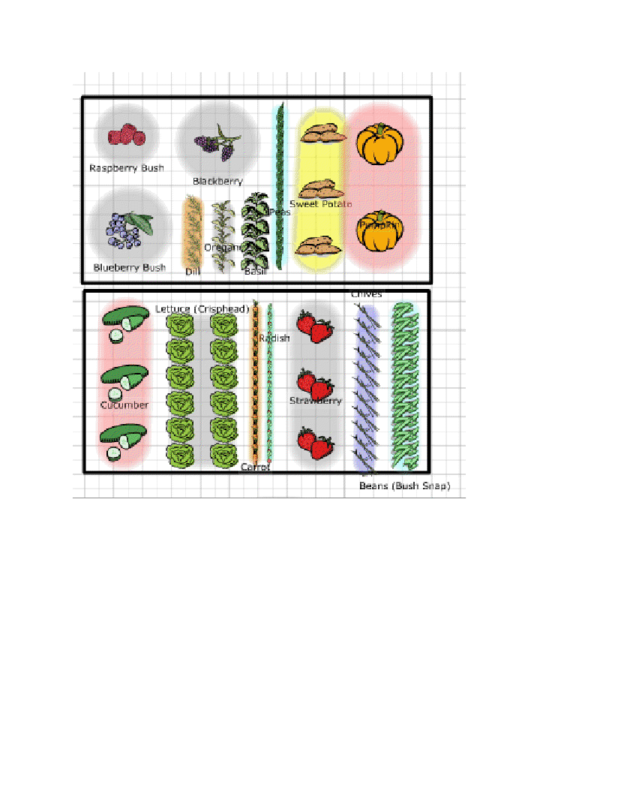 Cara created it on http://www.growveg.com/freetrial.aspx. Look for pics after the weekend of our new beds!